halo10v2 and 1 Guest are viewing this topic. You gots to cook it strong! In the single deck, 208 volt realm, is the Blodgett oven a better unit than the Baker's Pride for NY style pies? From what I've seen so far, the prices for a Blodgett are quite a bit higher than the Baker's Pride. I'm wondering what justifies the difference in price if both are of similar size and can get to the 550-600 degree range? Charles, we need more information than this. If you're asking about Blodgett countertops vs. Baker's Pride countertops, both are pretty much worthless. I respect Bubba's experience in the industry, but in this instance, he's dead wrong. For NY style, an oven lives or dies on how much power it has, and both of these brands of countertops are woefully underpowered- toaster ovens with stones. If you're asking about full size electric decks, I haven't run across many full size electric Blodgetts, but assuming the watts are comparable, there's nothing inherently better about an electric Blodgett over an electric BP. Neither are ideal, imo, for NY style, though. They have thermostats that go to fairly high temps, and they can typically reach these high temps, but the watts, even on full size decks like these, are insufficient for good recovery time between a substantial number of bakes- if you're going to buy a commercial deck oven, you shouldn't have to worry about recovery during high volume times. If you want the best bang for the buck, nothing can touch the vintage Blodgett 1000s that Walter is referencing, but that's a full sized gas deck, not electric and will require the gas connection inside your home- which could get pretty involved- not that wiring a full size electric deck oven is any easier in a typical home setting. As far as the best overall oven of all for NY.... it really depends on the bake time you prefer. For fast balanced bakes in an electric full sized, I think Pizzamaster (Sweden) get's the prize. For gas, the Marsal MB gets top marks. Long before you invest in any deck oven, though, you should make fast and slower baked NY style pizza in your home and determine which you prefer. If you're asking about Blodgett countertops vs. Baker's Pride countertops, both are pretty much worthless. If I had the space, choice of deck ovens and know what I learned here on the forum, of course I would now purchase a Blodgett 1000 with a thick deck. To say that any countertop Baker's Pride oven is pretty much worthless is a little harsh though in my opinion. I do like my Baker's Pride GP-61 deck oven and it has produced many tasty pizzas. Norma, because of his mention of '208 volts' the implication is that he's talking about electric ovens. In my first paragraph I'm referring to electric countertops. Your gas countertop definitely serves a very lofty purpose. FWIW, even though your oven technically sits on the counter, it's so large, and the specs so full size-ish, I consider it more of a countertop/full sized hybrid. You have to turn your pies more than Walter and, in a very high volume setting, the lower BTUs might be a bit of an issue, but, for your needs, I wouldn't really consider the 1000 to be that much superior. 7 minutes is 7 minutes, and I believe you can both hit that. I do believe, though, that BP electric countertops are pretty much useless. You've got an electric BP countertop, right? How often do you bake pizza in it? I guess I missed the '208 volt' in the OP. Thanks for saying my propane GP-61 serves a lofty purpose. You are correct that I have to rotate my pizzas more than Walter. The boardwalk style pizzas right now are baked in less than 7 minutes. No, I do not have an electric BP countertop. Norma, you never had an oven like this at the market? I could have sworn that I saw it in a photo you had posted. Weren't you using it for re-heating slices or something to that effect? No, I never had an oven like the photo you posted. I do have a 1/4 size convection oven. Maybe that is what you saw. The only thing I have ever used to reheat slices is the deck oven. I can take you back in time to the first photo of my pizza stand if you want to see a photo. Most of the Blodgett pizza ovens people seem to be using are gas, so my original question isn't really answerable. They are more expensive because they are much higher powered than a Baker's Pride countertop......apples to oranges. I was initially looking at the Baker's Pride countertop electric ovens because they are not very expensive. But the consensus is that these are not powerful enough to make a good NY pie or large numbers of pies in succession. Is gas the best option then? Maybe a better question is what models of Blodgett and Baker's Pride gas ovens are suitable for making many pizzas with low recovery times? The Blodgett 1000 and the Baker's Pride Y600 look comparable and both seem worthy. I can see why the used market is so popular with these, the prices new are incredible. A local used Blodgett 1000 was recently listed for $1300 and that seemed like a good deal for this area, where the supply is much lower than back east. Any other ovens that are comparable is quality and cost? "While BTU per square foot of baking surface may not be a scientific measurement of baking efficiency for pizza, it does illustrate where the deck oven models diverge. here is Larry, thezaman here on the forum, owner of lorenzo's Pizzeria in Oberlin putting a pie in one of my 1000's. If you look close you will see what I am saying about the doors and how there is a "blind spot" you have to get use to. The goal is for home use right now, but I want to be able to practice on an oven that will make a proper NY slice. The goal in the future is to start a shop. Ideally, this first oven could then be used in the initial phase of the operation. Charles, you're putting the cart before the horse. Every once in a while, we get new members shopping for professional ovens because they're laboring under the misconception that a professional oven is the only piece of equipment that can make authentic NY style pizza. Nothing could be further than the truth. If you have a home oven that can reach 525 with a broiler in the main compartment, you can, with 1/2" steel plate, match (and usually exceed) the results of any deck oven. Authentic NY style pizza is not a single entity. It's a range of sub styles. Walter prefers a 7-8 minute bake, and, for that kind of pizza, nothing beats a 1000. I, on the other hand, grew up eating softer/puffier 4-5 minute baked pies. 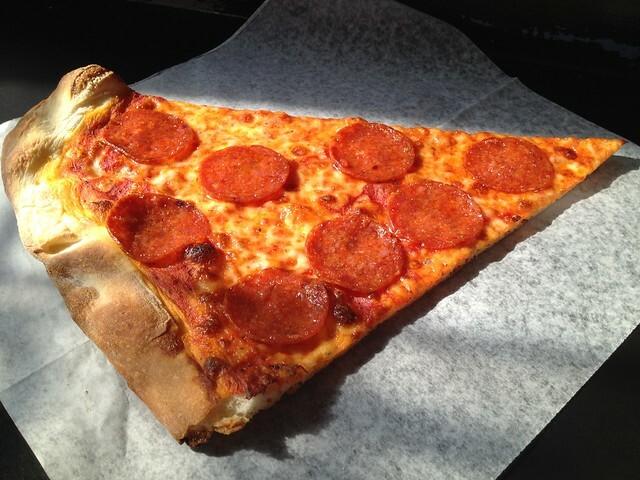 For that kind of classic NY style slice, you want either a pizzamaster or a Marsal. Before you do anything, it's absolutely critical that you start making pizza at home, in your home oven. Once you know what substyle of NY style pizza you prefer, then you can start shopping for ovens. Tell me about your home oven. Is it electric or gas? If gas, is the broiler in the main compartment or is it in a separate drawer below? What's the peak temp on the dial? Scott, thanks for the advice.....I am not looking to start a shop any time soon, but I want to be able to make an authentic NY style pizza in my home. The style I prefer would be thin, slightly chewy crust, oily cheese, medium size puffy edge, slight charring on the bottom, probably a 8-10 minute bake. The Bay Area is not renowned for their NY style pizzas. You are much more likely to find wood fired Neopolitan pizzas here. Those I like as well, but that type of oven is even more unsuited to home applications, unless you want to make 12" pies or jack up your oven. I plan on practicing up to 18" pies. So far I have not come close to making a true NY style of pie like Arinell. Right now I am trying the Trenton tomato pie recipes as it also seems like my kind of style (thin, and non-bready, basically). I also want to be able to practice making multiple pies, for a party for example to further hone my skills. What I want to avoid is making many mediocre pies because I don't have the right oven. Currently I have a weak gas oven with the broiler underneath the main compartment. It struggles to get above 525. I have a 1/2" steel plate on the way, so that will help, but maybe not enough. Is there an oven you can recommend under $1000 that can make a large, proper NY style pizza? Charles, is there still time to cancel your steel order? Steel is not the right choice for an oven without a broiler in the main compartment. The bottom of the pizza burns before the top is done. As far as which oven I'd recommend, there's so many different models out there and newer models coming out all the time, it's pretty much impossible to develop a list of the best ones for NY style, especially since so few people actually ask for advice on the forum prior to shopping. When it comes to pizza ovens, obviously, people are always asking, but for home ovens, it's very rare. 4. 19" depth- 18" pies are the holy grail of NY style pizza, and, for that you want at least a 19" stone, and an oven shelf that will fit it. 5. Dials for broil/bake settings are easier to use than a keypad (and break less frequently), but dialed ovens tend to be considerably cheaper, which, in turn, tends to make them smaller and less powerful (unless you start spending big bucks- some of the really expensive ovens have dials). 6. As long of a history as possible with plenty of good reviews going far back. 7. No lips on the shelves - There are ways around this, but if you can get a shelf without a lip at the back, it helps. 8. If you're spending less than $500 (which, as I said, puts the dimensions and the total power in question), you'll want to pay a bit of attention to the sturdiness of hte shelves, as especially weak shelves can be iffy with the weight of 1/2" steel plate. 9. 550 is plenty for NY, but if the oven can be calibrated up 35 degrees, that's even better. and it ticks off most of the items on this list. It has a keypad, which, as I said, I think is unavoidable, but he's hitting around 600 without calibration. The only real question is build quality and potential longevity. I haven't come across a lot of reviews and I'm not sure if this oven's been around long enough to generate many. Once this oven has a bit of a longer track record, I'll recommend it. I think you can find something that can check as many boxes at $700 or even $600- something that isn't stainless, but that's going to involve some major research. seems to think Avellino gives Arinell's a run for their money. I'm going to cook on a stone in the main oven then finish on steel in the broiler, briefly I imagine. In general, where else could the steel be useful....a Weber gas grill, Big Green Egg, or is it just intended for an oven with a broiler in the main compartment? Apparently some people use them as a type of plancha grill, on the stove top.....that sounds adventurous. Scott, I haven't tried Avellino, maybe next time I'm in the city. I was actually wondering if there exists a dedicated pizza oven could be had for less than $1000. That might be a pipe dream, except in the used realm. As for the home gas range, I 'm concerned that one with enough power (if it exists) wouldn't just end up being more than a Blodgett. The square shape and large cubic footage of a home oven means longer warm up times, right? The GE mentioned has 3200 BTU/sq ft. which might be enough...hmmm, that's 22 btu/sq ft. I don't think you will have much luck finding an indoor home use dedicated pizza oven that does a great job. If you go electric, you need a special outlet to carry enough juice - there is simply not enough demand for that type of oven to justify manufacturers to make them - other than Sage, or some Italian ovens, and they are pretty pricey. If you are willing to cook outdoors, there are plenty of options that have come out in the past few years that make great pies for under $500 using propane, or your own gas grill.